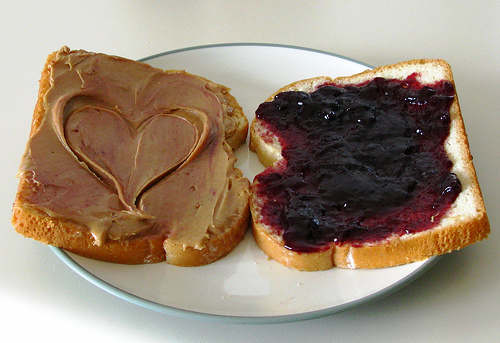 When I was a boy I remember making a peanut butter and jelly sandwich. I had already jellied the bread and was just about done with the peanut butter when the unthinkable happened! I dropped the bread with the peanut butter on it and you guessed it... it fell on the peanut butter side! Nobody would even dare think of eating it, especially since that sticky peanut butter was pressed against the ground. It was contaminated, dirty, ruined and corrupted. In the same way that we would never allow a corrupted sandwich from going into our mouth, we should be mindful that corruption should never proceed out of our mouth. We are reminded of that in Ephesians 4:29, “Let no corrupt communication proceed out of your mouth. The word “let” provided us with an indicator that we are the gatekeepers of our mouth. We have the power to allow or disallow communication to pass through our mouth. The words you speak are the words you choose to say so choose wisely because your words will either help or hurt those that you are around. Ephesians 4:29 continues with describing the importance of our words with this, ....but that which is good to the use of edifying, that it may minister grace unto the hearers. Use your words to build someone up and strengthen them. You can change someone’s life by the words you use. That enemy soldier “looked” like the other GI’s He was dressed like them. He walked like them. He behaved like them. BUT something gave him away. Something made him stand out. What gave him away? He was grateful for all the food he could get. He was thankful for the food no one else wanted. 1 Thessalonians 5:18 tells us that, “In everything give thanks...” Being thankful is the hallmark of every Christian. We should be known for how thankful we are. There are plenty of grumpy people in this world, but Christians should not be these kinds of people. Being grumpy is certainly not God’s will for us! This Thanksgiving season, let thankfulness rule in your heart, not just for a day, a few days or even a season! Let thankfulness rule in your heart all the time! The apostle Paul in Acts 27 was in a ship and in a Treacherous storm for nearly two weeks. During that space of time, the clouds were so thick that the sun wasn’t even visible. In fact, the lives of all of the crew members were in jeopardy to the point that they had a final meal and they started casting all unnecessary items overboard to lighten the ship. It was in the middle of this storm that Paul had an assurance from The Lord that no one would die. Paul held on to that promise as they finally made landfall. I can imagine that they were probably hungry, wet, and tired as they gathered around a fire created by the barbaric people of Melita. If the Storm wasn’t bad enough, and the fact that they were at the point of death; now they are faced with a barbaric people and a snake in the kindling. It is at this point that Paul and his crew have formally gone from the frying pan into the fire. What could possibly be worst? How much more can they handle? Haven’t you been there before? Haven’t you been the one to raise your voice and say the same thing? We have all been in that place at some point in our lives when we think that things couldn’t possible get any worst. Paul was bitten by a venomous snake that crawled out of the bundle of sticks he was carrying and was bitten. Paul didn’t die nor did he even get sick. God used that incident and the shipwreck to bring the people of Melita to The Lord. We can learn a few things from this event. God will always make you stronger when you get through your storm. Just because you are in a storm doesn’t mean that God has forgotten you. God has a plan and a purpose for your storm. When things look their worst, know that God is at His best. What the devil means for evil, God will make it for His good. God will always get the glory for your victory. Church, learn to trust in the Lord. Learn to lean on Him no matter how difficult your situation. ​“I’m tired”, Cindy said as we got home late one evening. It was after 12 midnight and it had been a long day. I don’t remember all of the details of the day, but we had capped the night off at Youth Rally and the youth really prayed good that night. Being tired was the by-product of all the goodness that God brings. In the summer of 2012, Cindy and I were tired in Spirit. We were at the crossroads of our future in ministry and we were spent. We needed some time to pray and get closer to the Lord so I leaned on a few friends from my bible school days and before we knew it, we were halfway across the country in Bowling Green, Kentucky. We spent a week there and I had very little money, but God supplied our needs by providing an evangelist quarters for us. We moved on to Western Kentucky for a few days and then on to northern Indiana. We were still unsure of what The Lord had in store for us, but we kept holding on to hope. I had been questioning my worth and my value to the ministry. I didn’t even know if there was even a place for me in the future of ministry. As we began the revival, God began to come by and He solidified things in our heart. We knew that there was in fact a place of ministry for us, and that we did have value and worth for the ministry. We came back renewed and revived as we pushed forward. Today, I look back on nearly five years of being the Pastor of Grace Temple Assembly of God. I stand in awe and I am humbled that God would choose our family to lead this precious church. There have been times we have been tired, weary, but we will not stop and we will not quit! I want to encourage you to do the same thing church. Determine to hold on and fight through everything that knocks you down or pushes you back. 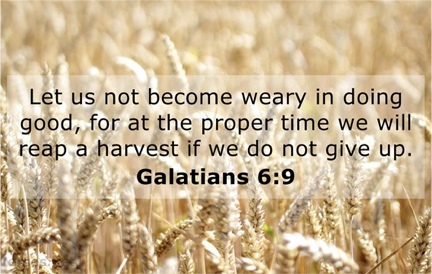 Push through every tired and weary situation, and you will find that there is coming a day of reaping for you! Do you know what is in this picture? If you guessed a manger, you are right! You probably guessed that it looked more like a feed trough for animals. You would still be right! The Bible era manger was in fact a feed trough used for animals. We know that there wasn’t any room for the young Joseph and a very pregnant Mary as they arrived into Bethlehem. The only place available was a barn that undoubtedly had animals in it. Joseph had to get creative and used a simple feed trough to swaddle the newborn baby King in. Many of us would be so demanding. My boys were all born in a hospital room and swaddled in a sterile environment comfortable and warm. It is hard for us to imagine that a new born King would be introduced to the world in such a degraded and humble manner, but Jesus was. The Word of God teaches about His humble death in Philippians 2:8 “…he humbled himself, and became obedient unto death, even the death of the cross.” I believe this speaks volumes about being humble. According the the Word of God in Romans12:3, it teaches us to “…not to think more highly that he ought to think;…” Church, in this Christmas season, be humbled by the Grace that God has provided for you. Be humbled by the Mercy He has shown to you and don’t be afraid to bless others by your humbleness. As I read about the humble beginnings of Christ on this earth, I am also reminded that he will return to this earth some sweet day. The next time Jesus comes back, it will not be in a humble manger but rather every eye will see Him and every knee will bow. He will not arrive in an obscure manger but as King of Kings and Lord of Lords. Until He comes again....Merry Christmas to you and yours! ​Back in 1988, a Polish railway worker named Jan Grzebski was hit by a train. He lived ... but only barely. For the next 19 years (until the year 2007), Grzebski was in a coma. He awoke in 2007 to a whole new world. Nineteen years earlier, Poland was a communist state. Grzebski noted that back then meat was rationed and there were huge lines at nearly every gas station. And, "there was only tea and vinegar in the shops." But 19 years later, he awoke to a free nation where he said there were "people on the streets with cell phones and there are so many goods in the shops it makes my head spin." But something puzzled him. "What amazes me is all these people who walk around with their mobile phones and yet they never stop moaning." These people had freedom, food, and wealth greater than Poland had had for decades ... and yet Grzebski woke from his coma to find that ALL they seemed to want to do was grumble! Church, we have so much to be thankful for this year, a building that is ours, a parking lot without deep holes, and a loving and generous people that truly love The Lord! If you don’t get into the habit of thanking God for what you DO have, you’ll soon become ungrateful because of what you DON’T have. It's time to focus on the blessing that He provides for us every day. Have a blessed Thanksgiving season! Hurricane Harvey formed relatively quickly in the Gulf of Mexico and has brought many challenges to the people of South Texas. I have been through several storms in my life beginning as early as Hurricane Celia in 1970. Each Storm has brought its own set of challenges unique to each storm and with every storm there are lessons to be learned. First, your life can be altered in the blink of an eye. You can’t take every day for granted. There are people that went to bed Saturday night never to wake up again on this side. The Apostle Paul in his letter to James compares life to a flower that blooms as the morning sun rises, then it’s gone. Life is precious! You never know when your life will be over. Make the most of it by living your life for Christ! Second, storms have a way of shaking things loose and sometimes have devastating effects. Boats that were in their slots at docks were picked up and carried into homes and businesses. Homes had roofs, shingles, siding, and patio furniture strewn around and blown into other neighborhoods. Some things were blown away never to be seen again. Church, spiritually speaking, there are times that storms in your life will create a shaking. You will have a wind come your way and create havoc, but know this! In every storm, there is still a God that watches over you. No matter what the devastation is that you have been faced with, God will make good come out of all the bad if we will continue to hold on to the hope that lies within us. Finally, as with every storm, there will be a cleanup. Those things that are broken, shattered, bent, and twisted will need to be repaired or cleaned up. I was with my boys on Tuesday cutting up trees and branches, picking up shingles from our roof, and trying to get back to a place we call normal. Your storm will require something from you. Spiritually speaking, you will have to put effort into getting back to your new normal. You cannot expect God to do everything for you. Joseph still interpreted dreams while in prison, so we must do our part to get back to where we need to be. At some point you will. There's no doubt about it. Before you can fully succeed, you will have to deal with failures. Learn from it! Gain from it! Grow from it and MOVE ON from it!!! The Psalmist David was a failure. Moses was a failure. Joseph failed. Gideon was completely inadequate and was working while hiding from the enemy. That is failure. If these great people failed and overcame their failure, THEN YOU CAN TO! It is time to stop floundering in your failure. It's time to stop complaining about your collapse. It's time to stop regretting your ruin. YOU WILL NEVER BE who GOD wants you to be as long as you choose to stay in your current condition. Get yourself up! Pick yourself up and get over your losses. You must realize that, "We are more than conquerors through Him that loves us!” Be a conqueror. Be an overcomer. Failure will come your way. Embrace it! Love it! It is the pounding of the iron that makes a sharp sword. It's the kneeling of the clay that creates a beautiful vase. Adversity is what will make you into what The Lord wants you to be. What is 26 feet tall, nearly 30 feet wide, and 13,170 miles long? Do you give up? ​It's The Great Wall of China! The Great Wall of China was constructed between 1368 and 1644 for the purpose of protecting the Chinese Empire from the invading Mongolians and other nefarious invaders at the time. Although most of the Wall has been destroyed, much of what remains today, nearly 6,000 miles was built during the Ming Dynasty and is a major tourist attraction. People come from around the world to see the remnants of what was once a very critical barrier from the enemies. The Great Wall today could never keep out invaders because there are many places where the walls are on existent or crumbling down. This is very much like the person described in Proverbs. You see, it is imperative that we learn how to control ourselves, have self discipline….” have the rule over our own spirit”. If we can't control ourselves then, “invaders” can come into your life and begin destroying who you are from the inside. Read God’s Word, Pray, learn to discipline yourself, and enjoy the benefits and satisfaction that spiritually you are protected from harm. Milton took his proceeds and moved roughly thirty miles from Lancaster back to his home in Derry Township, in the heart of Pennsylvania’s biggest dairy farms and began work producing and perfecting what had been a luxury product up until this time, milk chocolate! On March 2, 1903, construction began on what would become the largest chocolate manufacturing company, The Hershey Chocolate Company. Today, the Hershey name is known around the world! It has been an honor for Cindy and I to take our students to Washington, D.C, and Hershey, Pennsylvania. Hershey is affectionately called the, “The Sweetest Place on Earth”, and it certainly is, but not without the hard work and perseverance of Milton Hershey. I am reminded of the scripture in Ecclesiastes 9:10 “Whatsoever thy hand findeth to do, do it with thy might;…” I have often heard it said that success happens when preparation meets opportunity. I believe the same is true spiritually as well. God provides opportunities to us, but we need to be fully prepared. Therefore we need to take to heart these words in Ecclesiastes. Performing half-hearted will produce half-hearted results. Milton Hershey would never have been able to produce the candy company we have today without hard work and perseverance. Church, let’s put forth our best effort and continue to trust in the Lord for the opportunities he sees fit to bring to us! Off the north-western coast of France near Brittany, stands a towering lighthouse made famous by the French photographer, Jean Guichard who captured the lighthouse and its sole occupant during a treacherous storm in 1989. The now famous photo is called, “Phares dans la Tempete, la Jument” translated, “A Storm at La Jument”. In this photo of the lighthouse, a massive wave is about to overtake the lighthouse as a man stands in the lower doorway of the structure. The lighthouse keeper, Théodore Malgorne, is difficult to see in the picture, but once he comes into view, the size of the wave becomes evident as it is about to crash down on the place where the man is. Théodore somehow survives the pounding storm and lives to tell about his experience and finally gets to meet the man that took the photo. I have spent time in Western Pennsylvania and I have learned that this Texas boy needs to stay in Texas! The winters there are nothing like a South Texas winter. Now, call me what you want to, wimp, sissy...whatever...but their winters are brutally cold! The lake effect snow can lead to long winters and deep snow drifts, even in the month of March, and that can lead to many gray days. It was always a joy as April rolls around to see the sun break through the clouds, the temperatures rise and the flowers begin to bloom. I think the most telling feature of the seasonal change was the chirping of baby birds in their nests. In our lives we faces many seasons. Some seasons are dark and dreary because of the seriousness of situations that seemingly endure. In the book of Genesis we find a towering figure named Joseph. He was a young man with a vision...a dream. Unfortunately for Joseph his brothers didn't agree with his dreams and visions and he suffered the consequences of being sold into slavery, placed in a pit and prison. Finally, after years of opposition, he was elevated to the palace. I think it's important to note that in Genesis 50:20 Joseph told his brothers... after many years of difficulties that the things they did unto him they were meant to cause harm, but God meant it unto good. Joseph endured a very dark season in a pitiful pit, sitting in solitary, but the final outcome was the good of saving all of Egypt and his very own family. Yes, his brothers and their families. I realize that things get hard sometimes. I have walked through some dark times in my life as well, but I have been blessed to watch the hand of God at work. The winter is past, the rains are over and the flowers appear. It's a time of singing and refreshing, a time of birds cooing throughout the land. You can make it! You can endure! Call on Jesus today! John 14:1-3 1 Let not your heart be troubled: ye believe in God, believe also in me. Recently, I was conducting a chapel service for our students here at the Christian Academy and I experienced a Major Fail! I have been working hard this year to be able to, not only drive a point home, but to also hold their attention by using science demonstrations. This particular Chapel services I was supposed to be following the directions to add water with a certain liquid chemical to be able to form a certain reaction. Needless to say that during the demonstration, I ruined a perfectly good $20.00 bill...in front of all of my students and faculty! By the time I realized my mistake, it was too late, the bill was destroyed. All I heard was a big, collective gasp!!! I quickly acknowledged my mistake, covered my bible verses and closed the chapel service totally embarrassed. This was not only a major fail, but a major fail in front of everyone! You might find yourself in a major life fail. You might be embarrassed by the choices you have made, or the outcome of life, but I want you to know that our God is mighty. He can do amazing things! I might not ever be able to reclaim that $20.00 bill, but Jesus can fix your situation! 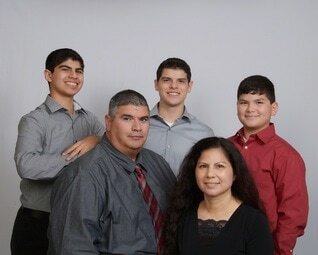 Where Families Can Grow In Christ!